GM issued an official order for dealerships to stop sales on the 2015 Cadillac Escalades last week over malfunctioning airbags, and rumor has it they've ordered dealers to stop selling the whole line of trucks and large SUVs until a new undisclosed issue is investigated. 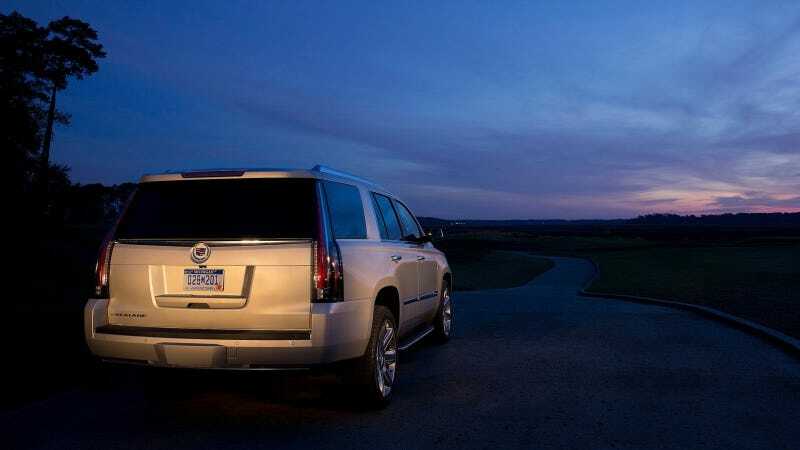 This is the 2015 Cadillac Escalade in all of its glory. Look at all of its LEDs. Automotive News says they picked up a bulletin yesterday to GM dealers calling for a "stop delivery" of "the 2014-15 Chevrolet Silverado and GMC Sierra, Chevy Suburban and Tahoe, GMC Yukon and Yukon XL and Cadillac Escalade and Escalade ESV." It seems as though these trucks aren't necessarily being recalled yet; just being looked over and having "suspect parts" inspected. I'm sure GM dealers, who were probably hoping to get some traction with their best-movers over Memorial Day sales, are nothing short of fuming over this if it's true. I suppose they can always sell their trucks and hope the issue's sorted by the time folks take delivery, but saying "we can't let you take it home just yet" isn't going to be much help on the negotiation table. If any of you are planning on hitting a Chevrolet, Cadillac, or GMC dealer for a new truck this weekend I hope you'll let us know how your experience goes!